The All-Star Break is a big deal in the major leagues for a few reasons: it comes near the middle of the season; it gives most players some time off; there’s a usually not-very-interesting game where you can see a lot of stars in one game being very careful not to hurt themselves. 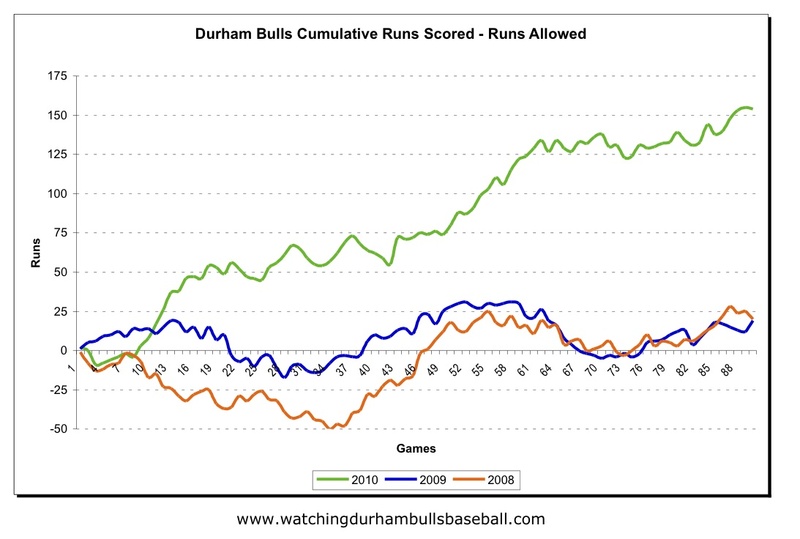 In AAA the Bulls are well-past the middle of the season with 90 games of 143 played. 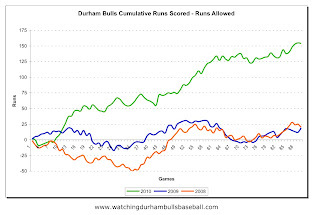 (Note: one of the rainouts can’t be made up, so the Bulls will be one short of the scheduled 144.) For the Bulls, mid-season came back on 23 June when the team was playing in Indianapolis. We only have 53 games left (27 at home). Nevertheless, it sort of feels like the middle of the season, and our guys, except for the futures players and our All-Stars, are getting a bit of a break. 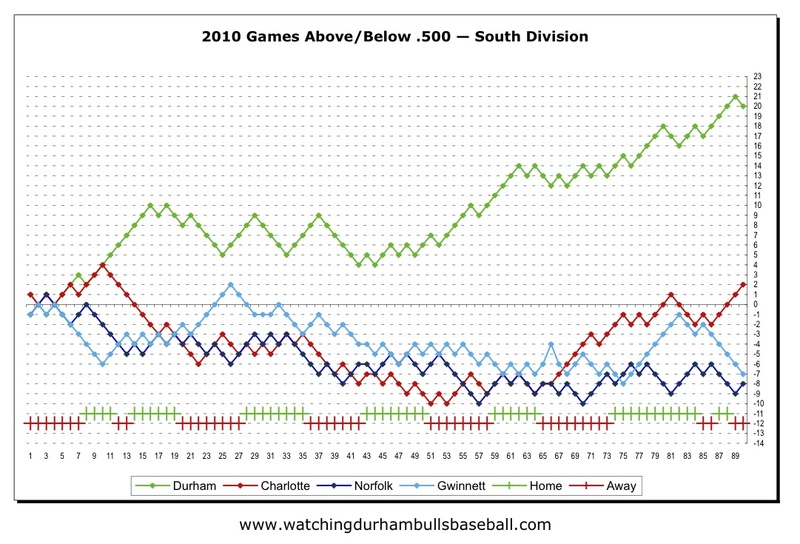 So, here’s some charts to kill the time while we’re waiting for baseball to start up again. Up top, a look at how we stand in the International League’s South Division. Obviously, pretty good. We are 20 games above .500 and 9 games ahead of Charlotte. 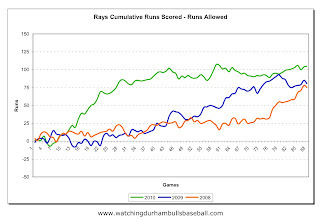 The Runs Scored/Runs Allowed chart is really exceptional. There’s a sabremetrics idea called Pythagorean Expectation that crunches runs scored and runs allowed and comes up with a won-loss “expectation”. In the Bulls case it tells us we “should” be at 60-30 instead of 55-35. What does that mean? I’m not sure. Other than we have really been scoring a lot of runs and keeping the other guys from scoring as well. That is, the Bulls are a very good baseball team. Another feature of the All-Star break is that major league teams start shuffling their rosters even more intensely than usual. That in turn means that our opponents are going to start looking very different from previous encounters. But this is a very intangible sort of thing likely to have more of an effect on internal team dynamics than the actual skill sets on display. A notable exception is the likelihood of seeing some extremes on the pitching side of things. That is, pitchers promoted too soon; or major leaguers down for a tuneup. 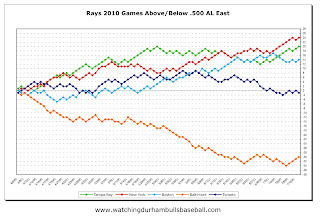 In general, the Rays have not been prone to significant shuffling of players even in the September call-up season. Nor have they focused on “trade deadline” deals. But there’s a first time for everything and we’ve got some real depth here that they have to be looking at. 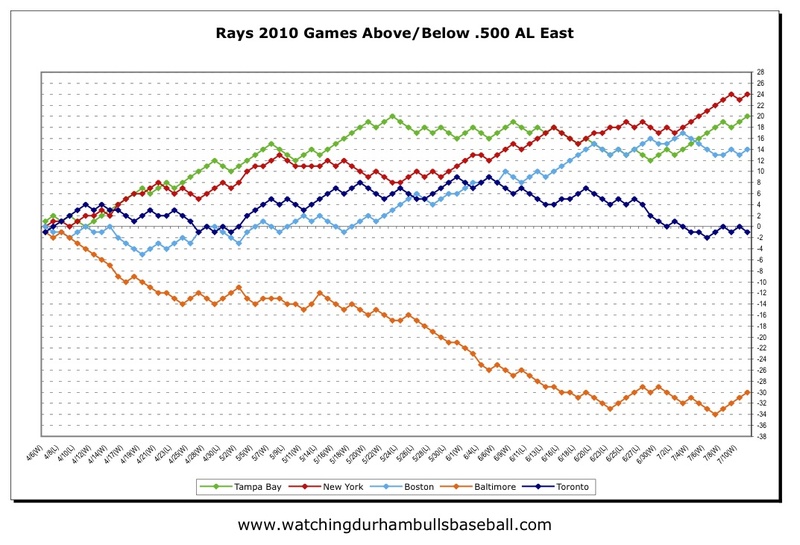 Speaking of the Rays, here’s how they look at the break after 88 games. Notice that they are also 20 games above .500. Unfortunately, the Rays play in the American League East. In any other division they’d be looking at a shot at the Series for sure. As it is, if the season ended today, they would be the Wild Card. Since they are in the AL East, however, they will be chasing the Yankees (and racing the Red Sox) all year. 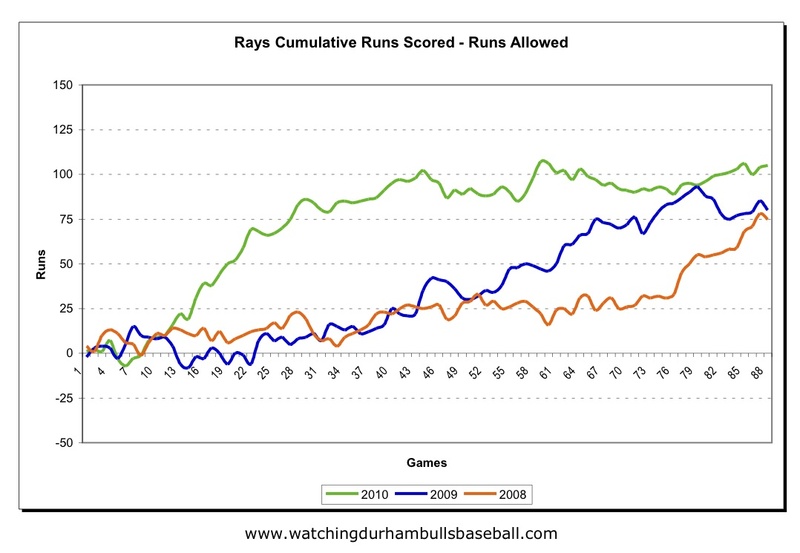 The Rays Runs Scored/Runs Allowed chart shows how they appear to have recovered from their June troubles. Their “Pythagorean Expectation” is 55-33 and the actual is 54-34. How did our guys do in the Futures game? Pretty good. [Box] Jeremy Hellickson pitched two innings and got the win. Desmond Jennings batted lead-off, did not get a hit, but got on base three times (walk, hit-by-pitch, reached on error), and scored three of the U.S.’s 9 runs. Justin Ruggiano was named Hitter of the Week in the International League. Pleased to see Justin get the recognition he deserves. It was a very good week for him. Here’s the press release. Durham outfielder Justin Ruggiano hit .355 with 3 home runs during the past week, and led the International League with 11 RBI and 7 extra-base hits. 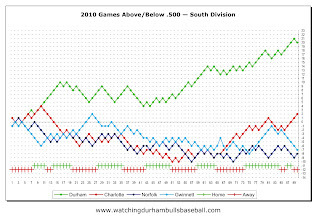 He hit safely in all seven games and drove in at least one run in six of the seven games to help Durham maintain the largest advantage of any of the division leaders in the IL. Ruggiano showed his versatility this week starting games at each of the three outfield positions, and in addition to his power he also stole a base and was tied for 2nd in the IL with seven runs scored. 28-year-old Justin Ruggiano is in his seventh season of professional baseball, and his fourth with the Durham Bulls. He is a former mid-season and post-season International League All-Star. Ruggiano is a native of Austin, Texas. I guess it shouldn't be a surprise to anyone that Dan Johnson won the homerun derby. Just got around to seeing the twitter feed. Sure didn't get much coverage. And just now getting press release. Good for Dan. Hope he made some money off of it.